Korean temple cooking is primarily based on seasonal plant-based ingredients. As such, temple dishes are vegan. 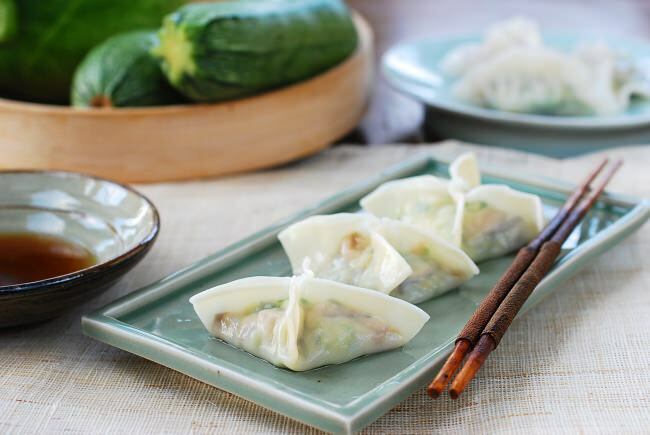 These simple zucchini dumplings are a summer favorite at temples in Korea. 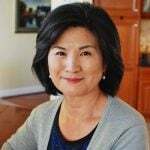 I recently had the opportunity to interview with a Korean TV network, BTN – Buddhist Television Network. BTN sent a team of four people to travel and film a documentary about Korean temple cuisine in different parts of America. They asked me if I could make some temple dishes and share my thoughts on the food and cooking style. I had a great time cooking and filming a small part of the program while sharing the dishes with the friendly crew. 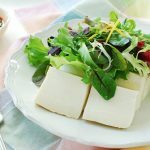 Temple food has been increasingly popular in and outside Korea by health conscious people, as well-being, healing food regardless of religious backgrounds. I was very glad to have this opportunity to learn more about it. 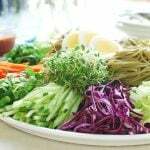 Korean temple cooking is primarily based on seasonal plant-based ingredients, which are either organically grown in temple grounds or harvested from nearby fields and mountains. As such, temple dishes are vegan! There are 5 forbidden vegetables, called oshinchae (오신채). They are garlic, scallion, onion, buchu (부추) – garlic chives, and dalrae (달래) – wild rocambole/small wild onion. These vegetables are considered stimulants which hinder spiritual meditation. Temple dishes are lightly seasoned only with natural seasonings, so they generally have a mild, clean taste. Temple cooking uses a wide variety of natural flavor enhancers such as mushroom powder, lotus root powder, perilla seeds, etc. as well as temple made Korean traditional fermented condiments such as soy sauce (aka jib ganjang/soup soy sauce), doenjang (soybean paste) and gochujang (red chili pepper paste). 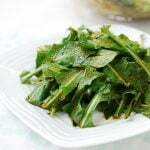 Because they have to work with limited ingredients, temple cooks are experts on identifying edible wild plants, creating many different dishes with limited ingredients, and preserving/pickling vegetables when they are in season for later use. In Buddhist temples, cooking and eating is considered spiritual meditation. The food is made with care to nourish the body, mind, and soul of those who eat it. Food is considered medicine. 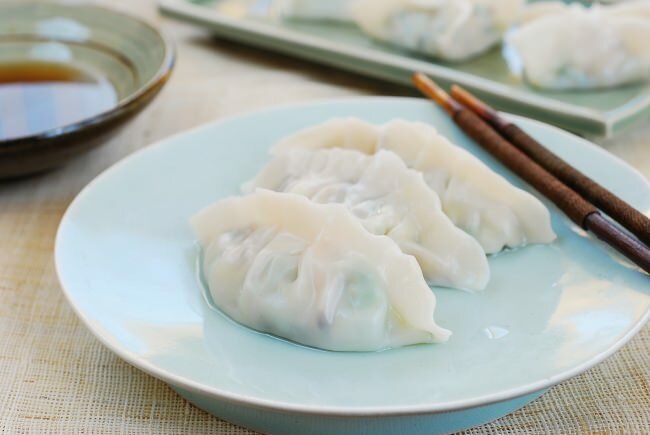 This dumpling recipe made with summer zucchini was recently featured on BTN as a favorite summer dish at Bongnyeongsa, the oldest temple in Suwon, Gyeonggi-do. I was totally intrigued by the simplicity of this recipe, which was made with only 2 filling ingredients, one of which is actually optional. 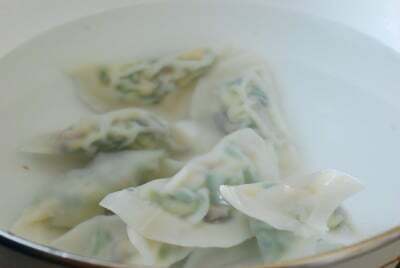 Bongnyeongsa boils these dumplings, cools in cold water, and serves cold. 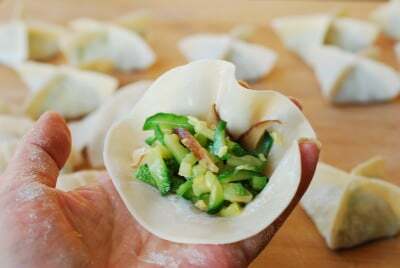 Let me tell you — what a refreshing change this was from my usual mandu recipes which involve several filling ingredients and lots of chopping and squeezing! It is so easy to make, guys! 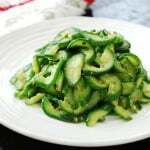 The best part of it is the nice and clean taste which allows you to simply savor the natural flavor of the sweet summer zucchini. The mushroom complements the zucchini with a bit of earthy flavor and meaty texture. Cut the zucchinis into thin disks and then into matchsticks. If the disks are big, cut in half before cutting into matchsticks. Sprinkle with 2 teaspoons of the salt, and let sit for about 15 minutes until wilted and some liquid is released. 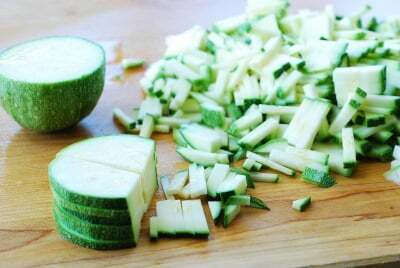 Gently squeeze the liquid out from the zucchini. 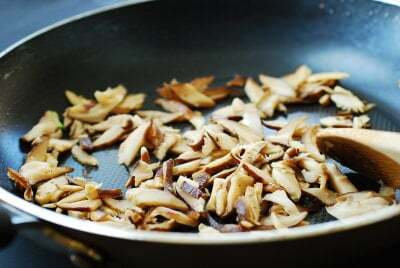 Cut the mushrooms into thin strips. 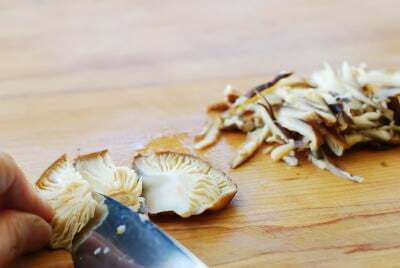 If the mushrooms are thick, slice them diagonally once or twice as if you are butterflying the mushrooms, and then cut into thin strips. Mix with the soup soy sauce (or salt) and a little bit (about ½ teaspoon) of sesame oil. Heat a pan over high heat, and add two teaspoons of sesame oil and the zucchini. 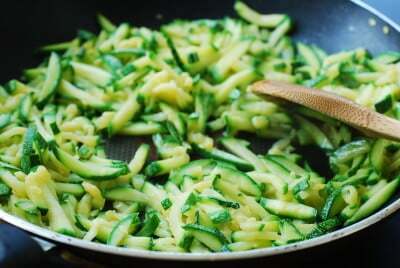 Stir fry until the zucchini is cooked and dry. 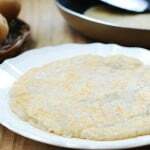 Transfer to a large plate and spread it around to cool. Heat a pan over medium high heat, and stir fry the mushrooms for 2 minutes. Add a tablespoon or two of water or mushroom soaked water if the pan gets too dry. 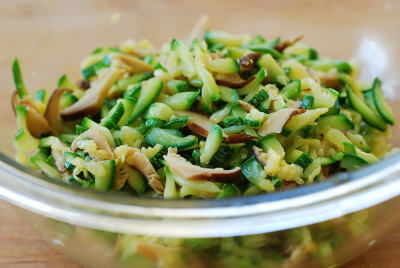 Combine the zucchini and mushrooms. Adjust the seasoning to taste if needed. Place one heaping teaspoonful of the filling on a wrapper placed on your palm. Wet the edges of the wrapper with water, fold the wrapper and seal tightly (pushing the air out with your fingers) into a half-moon shape. You can pinch one side of the wrapper to form pleats. Repeat this process until all the filling/wrappers are used. Bring a pot of water to a boil. Add the dumplings a few at a time, stirring gently so they don’t stick to the bottom of the pot. Cook only until the dumplings come up to the surface. Prepare a bowl with cold water. Remove the dumplings quickly, and plunge in the cold water to cool. Remove and serve cold with a dipping sauce (2 teaspoons soy sauce, 1 teaspoon vinegar, and 2 teaspoons water) if desired. 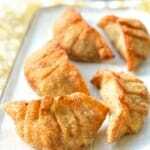 To make the square dumpling shape, wet the edges, pinch the opposite sides of the wrapper and seal the edges. Do the same with the other two sides. Make sure to seal the middle tightly. 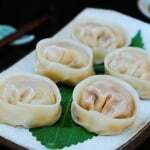 Regardless of the shape, make sure to seal tightly as the dumplings will be boiled. What’s the name of the programme that this recipe & others will feature on? Really appreciate you are doing temple cuisine! Not sure about the name, but it is scheduled to be released in November this year. I will post the link when it comes out. I’ll be posting more temple dishes. Stay tuned! How easy! Thank you for sharing the recipe. I will get some wrappers the next time I am at Lotte or H-mart. In the ingredients list, you forgot to specify how much soup soy sauce to use. Is that 1/2 tablespoon? Thank you for letting me know, Latha! I’ve fixed it. Thank you so much for this simple and tasty recipe! How could one make the wrappers from scratch, at home? Of course! Just make sure you seal tightly when you make them so they don’t open when frozen. You’re welcome! delicious and healthy – I love it too! Thanks for the note! Hello there! I’m writing you from Argentina. I love all your recipes and it’s being beautiful to try them all. However, there is very little options of Asian ingredients here since there isn’t much people into it. So here mi question. 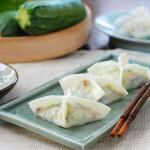 How can I make the dumpling wrappers on my own so they are as awesome as the ones you are using? Thank you very much! I wondered if you could make these a day in advance? Yes! Freeze them and use whenever you want. Can I make a bunch and freeze some of them? And if so, do you have any tips to reheat it? Of course! You can simply boil until they float to the top or steam. 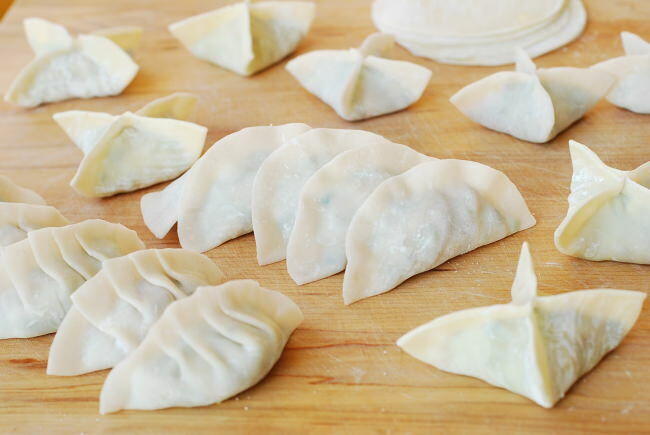 If you freeze cooked mandu, you can defrost at room temperature and then microwave covering with wet paper towel or napkin to prevent the wrappers from drying out. 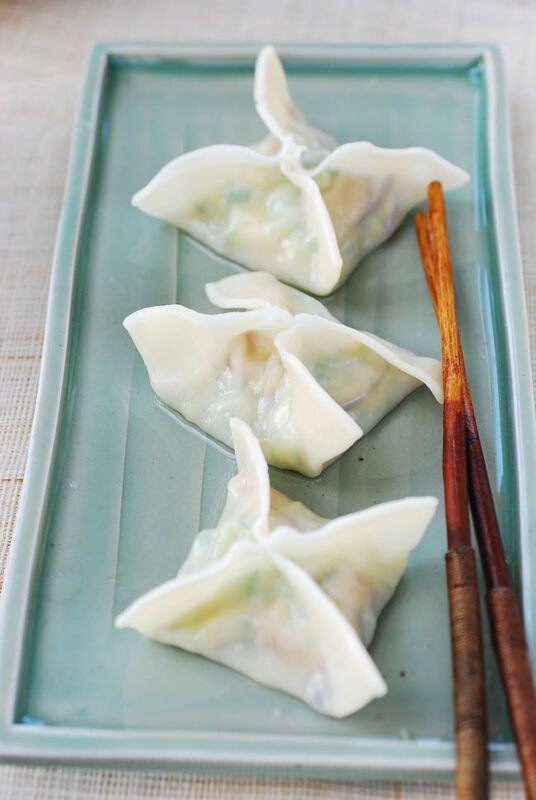 Can’t wait to try these…the dumplings look so beautiful, like little pillows! I’ve been following you for several years and love all the vegetarian and vegan recipes. These were amazing!!! Thank you for the recipe! Great to hear! Thanks for letting me know and for the great review!